St. John’s Lodge No. 3 has entered into an agreement with the DigitalNC program of the North Carolina Collection at UNC-Chapel Hill to have our oldest minutes and other records scanned for security purposes and to be made available on-line through the program. John B. Green III, Master of St. John’s, made the first delivery of records to Chapel Hill on Thursday, March 3, 2016. The first volumes to be scanned are Minute Book 1, Minute Book 2, Minute Book 3, and Cash Book 1 covering the period 1772 to 1849. Brethren: For the first time in more than 100 years, St. John’s Lodge No. 3, New Bern, now owns its original 1801 lodge building in its entirety. St. John’s Lodge sold its building to the Scottish Rite in 1914 retaining ownership of its historic lodge room only. Now, after complex negotiations, the Scottish Rite has returned to St. John’s Lodge, by quit claim deed, its original lodge building, plus the now-abandoned Scottish Rite Temple seen on the left, as well as an adjacent parking lot. 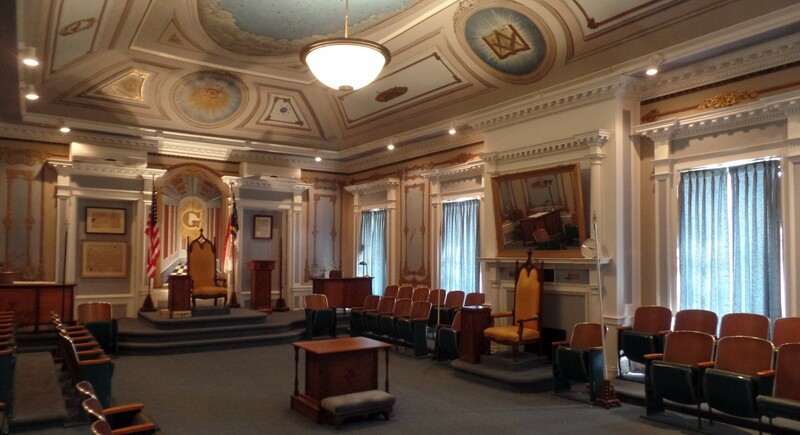 This is an exciting (and frightening) time for St. John’s Lodge No. 3. We choose, however, to move forward with hope and confidence as we begin to rehabilitate these buildings and make them living, useful spaces again. The support and prayers of all the Brethren across North Carolina are earnestly solicited. SO MOTE IT BE!